It is estimated that over 1.7 million people died from starvation, execution, disease, and over-work during the Cambodian genocide, which took place between 1975 and 1979. It has been established that the Khmer Rouge targeted particular groups of people, among them Buddhist monks, ethnic minorities, and educated elites, who were referred to as “new people.” 1 Unlike the “base people” who joined the revolution prior to 1975, “new people” did not take part in “the struggle” to defeat the US-backed Lon Nol regime. As such, their commitment to the Party Center and its policies was considered suspect. When villages and regions were not able to fulfill the Center’s expectations for rice production, for example, the Party looked for scapegoats rather than reassessing its goals. While “capitalist imperialists” were a standard target of Party rhetoric, the Center looked increasingly inward rather than outward to find enemies. “New people” as a group provided an easy target and were increasingly singled out as traitors intent on sabotaging the goals of the revolution. To avoid being targeted, “new people” tried to hide their group identity and be as inconspicuous as possible. One way of doing this was erasing all signs of education under the previous regime. But was the ability to read and write grounds for persecution under the Khmer Rouge? To avoid being targeted, people did not wear glasses; no one dared speak French; and reading a novel was considered a capital offense. On the basis of these facts, many have concluded that the Khmer Rouge were against education in principle and preferred to rule over illiterate people. It is thus surprising to learn that the Khmer Rouge produced at least three monthly publications. We also know that children were taught to read and write under the auspices of the regime, and that Khmer Rouge cadres kept extensive notebooks from indoctrination sessions. In addition, Khmer Rouge cadres were required to complete an eleven page questionnaire describing their family backgrounds and personal histories. A simple peasant thus had to write a significant amount of information to become a revolutionary propagandist. How would a farmer have known how to write? Although we dont have any reliable figures for what percentage of the population was literate in Khmer at the time, it is reasonable to expect that a farmer like Ly Sok Khy would have learned basic skills. And whereas there were many illiterate heads of rural cooperatives and soldiers at the lowest level of command, illiterate persons could not enter central party structures. To rise in the state and party hierarchy, one needed to know how to read and write. Thus, education per se was not anathema to the regime. Rather, it was colonial education or feudal education associated with Norodom Sihanouks rule that was seen as inherently contaminated and suspicious. 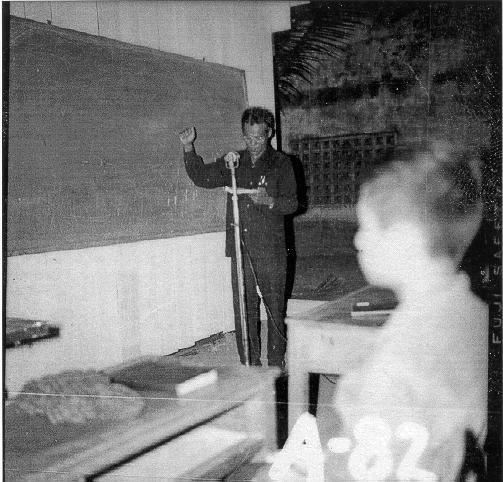 This essay considers the function of literacy and education under the Khmer Rouge. 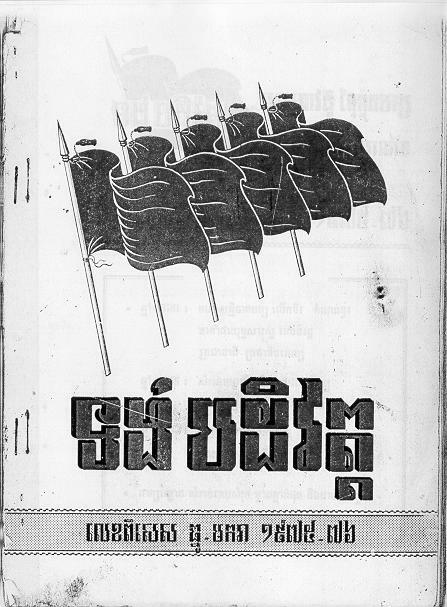 In particular it examines Tung Padewat (Revolutionary Flag), a magazine published monthly by the party of Democratic Kampuchea 2 between 1974 and 1979. At a glance, it is clear that the magazine was used for propaganda purposes. But beyond that, what does the magazine reveal about the way the Party Center 3 tried to represent the revolution? Does it give us some insight into the ideology of the Khmer Rouge leadership and in particular the function of literacy in their overall effort to radically transform Cambodian society? To pursue these questions, this essay looks at Tung Padewat in two ways. First, it will examine the magazine in relation to the Party’s “Four-Year Plan,” a blueprint of the major goals and objectives of the revolution. What were the primary objectives of the Party? How does the magazine articulate these objectives? What role did literacy play in achieving them? Second, it will consider individual issues of the magazine in relation to previous and subsequent issues to see if the representation of certain policies changed over time. Of particular interest here are changes in the format or content of the magazine that may reflect changes in the Party’s priorities, attitudes towards literacy, or the regime’s “moral economy,” including reasons for persecuting certain groups of people. The notion that reading and writing were entirely forbidden under the Khmer Rouge is inaccurate. Not only did the Khmer Rouge produce thousands of pages of written documents, but they also intended to develop an educational system to teach literacy. This is consistent with the fact that Democratic Kampuchea was a communist-inspired regime that looked to the policies of communist revolutions elsewhere for models of reorganizing society. When exploring the Khmer Rouge educational strategy, it is necessary to understand that the destruction of the educational system was against all Marxist traditions and rules. In general, education is of primary importance within Marxist theory; together with the revolution within the economic field and political organization, cultural and educational revolutions are the center of practical policy of communist regimes in building new society. Thus, it is clear that the Khmer Rouge were not, in principle, afraid of the ability of common people to read and write. It was, therefore, what and how one read, rather than the ability to read and write, that made certain kinds of people suspect. As with every other aspect of daily life, the Party Center wanted to be in complete control of how, when and what people wrote, read, and thought. The Party’s “Four-Year Plan” demonstrates that literacy training for the general population was part of its plan for overhauling Cambodian society. The Plan, a one hundred and ten page typewritten document, was drawn up at a meeting held between July 21 and August 2, 1976, by the Standing Committee of the Communist Party of Kampuchea (CPK). This meeting was attended by nine men and women, including Pol Pot, Nuon Chea, Ieng Sary and Khieu Samphan. Although the document was never published or fully implemented, the activities it describes reveal the Party Center’s long-term objectives at the time of its writing. As with all major initiatives of the Khmer Rouge revolution, the first step was to eliminate all traces of Cambodia’s “imperialist” past. Once this goal was accomplished, a “pure” revolutionary consciousness could be inculcated. 5 With regard to literacy, the first step of the Plan was “to abolish, uproot, and disperse the cultural, literary, and artistic remnants of the imperialists, colonialists, and all of the other oppressor classes…” The second step was “to strengthen and expand the building of revolutionary culture, literature and art of the worker-peasant class in accordance with the Party’s proletarian standpoint.” 6To eliminate remnants of “the oppressor classes,” the Khmer Rouge persecuted people they defined as “new people. The ability to speak French, for example, revealed one’s association with Cambodia’s colonial past and made one’s commitment to the revolution suspect. The Khmer Rouge leadership intended “to smash” this segment of the population, whose allegedly corrupt past precluded their ever attaining a pure revolutionary consciousness. In their place, the Party would cultivate a new generation using “songs and poems that reflect good models in the period of political/armed struggle…” whose education was not tainted by the “oppressor classes”. I. The Fields of Revolutionary Culture, Literature, and Art of the Worker-Peasant Class in Accordance with the Party’s Proletarian Standpoint. A. Continue the struggle to abolish, uproot, and disperse the cultural, literary, and artistic remnants of the imperialists, colonialists, and all of the other oppressor classes. This will be implemented strongly, deeply and continuously one after the other from 1977 onwards. B. Continue to strengthen and expand the building of revolutionary culture, literature and art of the worker-peasant class in accordance with the Party’s proletarian standpoint. Organise work towards continuously and progressively strengthening and expanding them as assigned annually, from 1977 to 1980 to meet the requests of worker-peasant masses for the nurturing of culture, political awareness, and consciousness. Especially the strengthening and expanding of songs and poems that reflect good models in the period of political/armed struggle and in the revolutionary war for national and people’s liberation, in the period of national-democratic revolution, and songs that describe good models in the period of socialist revolution and the building of socialism. In primary education it is important to give attention to abolishing illiteracy among the population. Secondary education especially in the technical part, must simultaneously begin to some extent from 1977. In our education system there are no examinations and no certificates; it is a system of learning through the collective and in the concrete movement of the socialist revolution and the building of socialism in specific bases, especially in the co-operatives, factories, and military units. history of the revolutionary struggle of the people, the revolutionary struggle for the nation, the revolutionary struggle for democracy, the revolutionary struggle for socialist revolution, and the struggle to build socialism. We must choose (people with) backgrounds that adhere to the revolutionary movement and have the quality to grasp the Partly’s [sic] educational line and are able to apply it concretely, and continuously strengthen and expand their own capacity in the concrete movement. A) Radio Broadcasting: organise general listening sessions using loud speakers in all important places and mobile work brigades. B) Films: of the revolutionary movement’s present and past, especially the present. Organise many groups to produce many films to show to the people in general. C) Art: Step-by step (a little is enough) in order not to disturb the productive forces raising production. D) Newspapers: pictorial magazines, political magazines and general knowledge. Be careful in building, strengthening and expanding the ranks by choosing (people of) backgrounds close the revolutionary movement (who) can apply the Party’s policy to instruct the people and disseminate propaganda and information. Organise printing in foreign languages, especially English, starting from mid-1977 onwards. A. Workshop or place for experimentation in co-operatives and important factories. C. Poly-technical School with practical primary and secondary levels. Procedure: Organise these simultaneously from 1977 onwards, according to the Plan and its annual program. The Plan does not outline in any detail how the regime intends to implement its objectives regarding education and literacy. For example, important pedagogical matters such as teacher selection and training, and the development of curriculum and materials are not discussed. Nonetheless, the document does provide a glimpse of the Party’s view of education in general and literacy in particular. Not surprisingly, agricultural production was given priority over education. In the brief section entitled “Daily education methods,” the plan calls for dividing the day between study and “work for material production.” Because of the labor required to meet the Party’s unrealistic goal of three tons of rice per hectare, allowing people to study full-time was unthinkable. The document also demonstrates the Party’s attempt to eliminate opportunities for individual achievement. Individualism was seen as a threat to the Party’s ideology and the all-important instrument of the co-operative that would carry out the goals of the revolution. In the same section of the document that calls for dividing the day between study and work, we find this statement: “In our educational system there are no examinations and no certificates; it is a system of learning through the collective and in the concrete movement of the socialist revolution and the building of socialism in the specific contexts, especially the co-operatives, factories, and military units.” Conducting examinations or awarding certificates would have provided recognition for individual achievement, thus promoting competition. According to Party ideology, an individual’s efforts were made on behalf of the co-operative for the benefit of the Organization,Angkar, and ultimately for the revolution, rather than for personal gain or acknowledgement. One of the purposes of these schools was to teach the population the “correct” way to read and write. The correct way to read was to read as a “peasant” (see Heath 1983 on different ideologies of literacy). That is, one should read in an uncritical and passive way, taking things at face value and not questioning the meaning or source of the text. Many base people had received traditional Buddhist educations in a pagoda, or, in the case of women, at home, where they would have been taught through rote learning. This kind of reader would take the rhetoric of the revolution at face value without questioning underlying motives. The most dangerous kind of reader, on the other hand, was the person who critically examined the Party line and its goals. According to the logic of the Party Center, these readers were potential traitors who wanted to sabotage the revolution. They were typically “new people” who had been educated in Phnom Penh or other urban centers under the French curriculum. They were thus “corrupted by imperialistic ideas” that were anathema to the goals of the revolution. There were also reasons for the Party to be wary of using written propaganda. If written propaganda had been widely distributed during the regime’s early stages, “new people” would have had the role of disseminating its message to the base people, who were, in many cases, illiterate. This would have posed a threat to the Party’s authority. It was therefore necessary to assert firm control over printed materials and the way they were received before large scale efforts to produce and disseminate written propaganda could take place.11 The Khmer Rouge accomplished this first by eliminating all those who read “incorrectly,” and second by educating the population on how to read “correctly,” beginning with children and base people. Throughout the period of its publication, the format of Tung Padewat remained consistent. On the cover of each issue are five overlapping red flags (Figure 3). The flags all wave in the same direction, and the top of each flagstaff has a pointed tip with a tassel pointing to the right. Below the five overlapping flags, the Khmer words Tung Padewat appear in large shaded letters written in the round Mul script. And at the bottom of the page are the issue numbers, the month, and the year of the publication. Except for the issues designated as “Special Issues,” the issue numbers correspond to the month of the year; e.g., No. 4 is for April. While it is beyond the scope of this essay, it would be interesting to investigate Chinese publications that may have served as models for Tung Padewat. In terms of imagery, the red flag clearly represents communism. Oddly, though, the flag itself is blank and does not have the familiar silhouette of Angkor Wat that emblazoned the national flag of Democratic Kampuchea. Is it possible that the magazine was financed by the Chinese who might have preferred that Angkor Wat not be included? Do the five flags symbolize the five towers of Angkor Wat? In addition to the red flag, another symbol of communism in the magazine is the hammer and sickle that often appears below the title of articles. The use of this symbol raises similar questions regarding outside inspiration. It is not clear what distinguishes the Special Issues of the magazine from the other issues. The “Special Issues” of Tung Padewat generally coincided with an important event in the history of the Party and/or contain an article commemorating an important event. For example, the April 1977 “Special Issue” falls on the second anniversary of the Khmer Rouge take over of Phnom Penh and contains an article celebrating this event. The December 1975 - January 1976 “Special Issue” has a feature article recounting the history of the Party since 1960. Similarly, the September-October 1976 and the September 1977 “Special Issues” have articles commemorating the 16th and 17th anniversaries respectively of the Communist Party of Kampuchea. The magazine’s focus on agricultural output is also a primary theme in the following year’s issue. The February-March 1976 issue has one article entitled “Fierce gains have been achieved because of ‘The Super Great Leap Forward’ ”, which appears to be a clear reference to the Chinese revolution’s “Great Leap Forward.”16 The next article is called “Preparing for the great initiative of the 1976 rainy season in order to achieve three tons per hectare.” Again these issues contain posed pictures: one of workers building dikes in Siem Reap, and another of workers digging an irrigation trench. In this issue one also notices the Khmer Rouge’s growing concern for its enemies. For example, the third picture in the February-March 1976 is an image of Khmer Rouge soldiers with a caption praising them for making use of their free time from “protecting the border” to plant rice. Tung Padewat provides us with an example of Khmer Rouge propaganda literature. There are many ways in which the magazine represents a window onto the events that took place in Cambodia during the genocide of 1975-1979. Through the magazine’s rhetoric, one can track how the Party defined its enemies at different periods during the regime. The visual images in the magazines also provide information on how the regime saw itself, as well as the Cambodian people, over the course of time. If it were possible to contact individuals involved in the magazine’s production, or those who read it on a regular basis, one could learn more about the regime’s stance on literacy. At the very least, though, these documents belie many of the truths of Pol Pot’s regime, and are, above all, concrete evidence that reading and writing were not forbidden by the regime, but were carefully controlled and engineered to further the aims of the revolution. Chandler, David, Ben Kiernan, and Chantou Boua, eds. And tr. Pol Pot Plans the Future: Confidential Leadership Documents from Democratic Kampuchea, 1976-1977. New Haven: Yale University Southeast Asian Studies Monograph Series 33, 1988. Heath, Shirley Brice. Ways with words: language, life, and work in communities and classrooms. Cambridge and New York: Cambridge University Press. 1983. Kiernan, Ben. The Pol Pot Regime: Politics, Race, and Genocide in Cambodia under the Khmer Rouge, 1975-1979. New Haven: Yale University Press. 1996. 1 Kiernan, The Pol Pot Regime. 2 The party of Democratic Kampuchea and the Khmer Rouge are used interchangeably in this essay. 3 The Party Center refers to the ruling clique within the party of Democractic Kampuchea, including Pol Pot, Nuon Chea, Ieng Sary and Khieu Samphan. 4 Chandler, Kiernan, and Boua, Pol Pot Plans the Future, 36-40. 5 Kiernan organizes the first two parts of The Pol Pot Regime on this very theme, using the metaphor of literacy: “Wiping the Slate Clean” and “Writing on the Slate.” Kiernan, The Pol Pot Regime, Parts I and II. 7 Pol Pot Plans the Future, 113-114. These songs and poems are some of the first examples of Khmer Rouge literature. 8 Excerpted from Pol Pot Plans the Future, 113-115. 9 People’s freedom of movement was also strictly regulated. People were assigned to work in a particular area and needed permission to leave that area in order to visit relatives, for example. 10 Pol Pot Plans the Future, 41. 11 This may explain why the Khmer Rouge had no equivalent to Mao’s “Red Book” (despite frequent references the Chinese revolution, such as “the super great leap forward”) and why the Khmer Rouge relied primarily on oral propaganda and indoctrination meetings. 12 It is interesting to note that no propaganda novels were produced during the DK regime. In contrast, they were produced in relatively large numbers after 1979 under the Heng Samrin and Hun Sen regimes. Annual writing contests supported by these later governments gave prizes for prose and poetry. The novels follow a formulaic plot structure in which the Vietnamese are cast as heroes for ousting the nefarious “Pol Pot-Ieng Sary clique” and enabling the Cambodian revolution to proceed on the right path. 13 The Cambodian Genocide Program has copies of the following issues of Tung Padevat(Revolutionary Flag): 1975: No8, August 1975; Special Issue, Oct-Nov 1975; Special Issue Dec 1975 -Jan 1976; 1976: No2-3, Feb-Mar 1976; No5, Apr 1976; No6, June 1976; No7, Jul 1976; No8, Aug 1976; Special Issue, Sep-Oct 1976; No11, Nov 1976; Special Issue Dec 1976-Jan 77; 1977: Special Issue, April 1977; No6, Jun 1977; No7, Jul 1977; No8, Aug 1977; Special Issue, Sep 1977; Special Issue Oct-Nov 1977; Special Issue Dec 1977-Jan 1978; 1978: No2, Feb 1978; No3, Mar 1978; No4, Apr 1978; Special Issue, May-Jun 1978; No7, July 1978; No8, Aug 1978; No9, Sep 1978. The CGP has the following issues of Yuvachun nung Yuvunarie Padewat [Boys and Girls of the Revolution]: 1974: No2, Feb1974; Special Issue, Aug-Sep 1974; 1975: No7, Jul1975; Special Issue, Sep 1975; No10, Oct 1975; No11, Nov 1975; No12, Dec, 1975; 1976: No2, Feb 1976; No3, Mar 1976; Special Issue April 1976; No5, May 1976; No6, June 1976; No7, July 1976; No8, Aug 1976; No9, Sep 1976; No10, Oct 1976; No11, Nov 1976; No12, Dec 1976; 1977: No1-2, Jan-Feb 1977; No3, Mar 1977; No4, Apr 1977; No5, May 1977; No7-8, Jul-Aug 1977; Special Issue, Sep 1977; No10-11, Oct-Nov 1977; 1978: No1-2, Jan-Feb 1978; No3-4, Mar-Apr 1978; No10, Oct 1978; No11, Nov 1978.The CGP has the following issue of Renaseris Kampuchea [Kampuchea Front]: 1975: No8, Aug 1975. 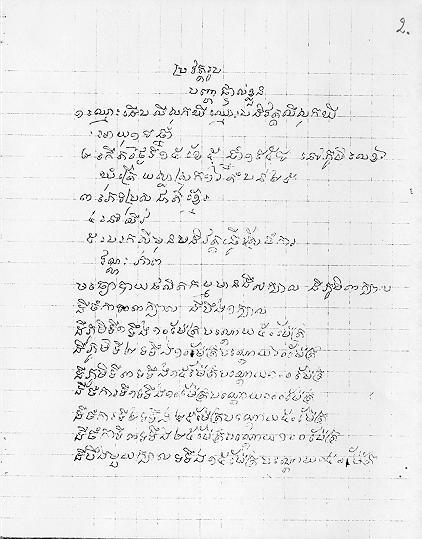 14 The two issues of Yuvachun Nung Yuvunarie Padewat held by the Cambodian Genocide Program, which were published before April 1975, are handwritten. 15 The production of plaster busts of Pol Pot indicate that an attempt was made at some point before 1979 to develop a personality cult of the Party leader that was similar to the status enjoyed by previous Cambodian leaders, including Norodom Sihanouk. 16 Pol Pot Plans the Future, 11. 17 A Khmer Rouge document attributed to Pol Pot dated December 20, 1976, pronounces the need “to expel treacherous elements that pose problems to the Party and to our revolution.” Using characteristic Khmer Rouge euphemisms, the document describes suspected traitors as microbes and calls for their extermination with terms such as “smash” and “sweep aside.” The document indicates that the purging of suspected enemies of the revolution had already begun and there was a clear directive from the Khmer Rouge leadership for the purges to continue. The document states: “If we wait any longer, the microbes can do real damage” (See Pol Pot Plans the Future, Doc 6:183-186).